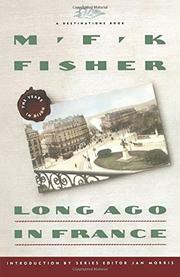 If you have read much of Fisher's earlier autobiographical jottings (Dubious Honors, 1988, etc. ), you've probably heard about her blissful early years in France, newly married to her first husband and living a student life in a Dijon boardinghouse, in two tiny rooms with hideous wallpaper and a lumpy mattress. It has always been an enchanted time in her memory, when she learned to eat well and drink wine and then, in their own apartment, began to cook. Here, we get that period, now 60 years past, sorted out and set down in one good chunk, evoking with cordial clarity the boardinghouse's two consecutive landladies, their households, and their cooking, and recollecting--in impressionistic strokes as she experienced them--the restaurants and cafes, the school's faculty and their wives, and the other foreign students. The book is never more substantial, and rarely more dramatic, than that, but it has the charm of a visit with an old friend, with the young and the old Fisher one vibrant personal presence.